A sparrow is a sparrow is a sparrow…. Or is it? 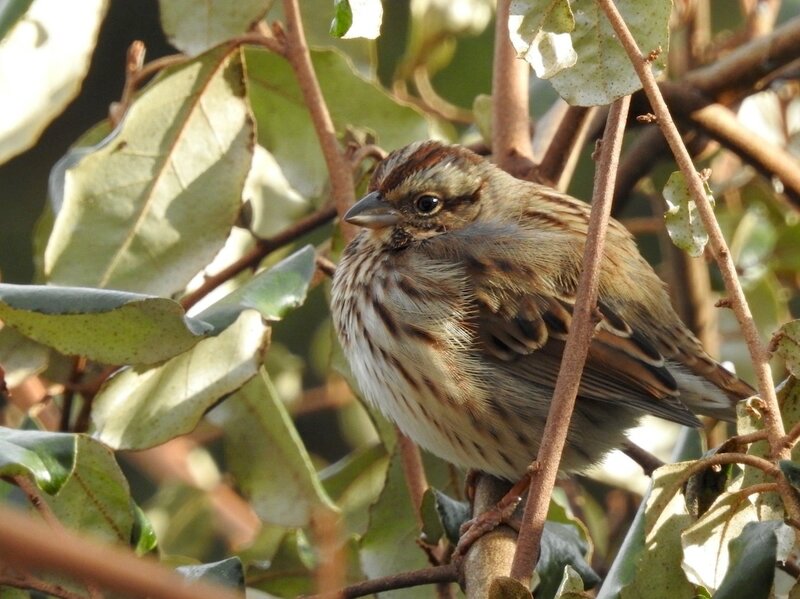 I saw house sparrows on my walk today, but I also saw a song sparrow (Melospiza melodia). And song sparrows have a pretty song. Just as I finished photographing the individual above, I noticed another sparrow fly into a nearby holly. I couldn’t see it well, so I focused my lens on it and zoomed in. 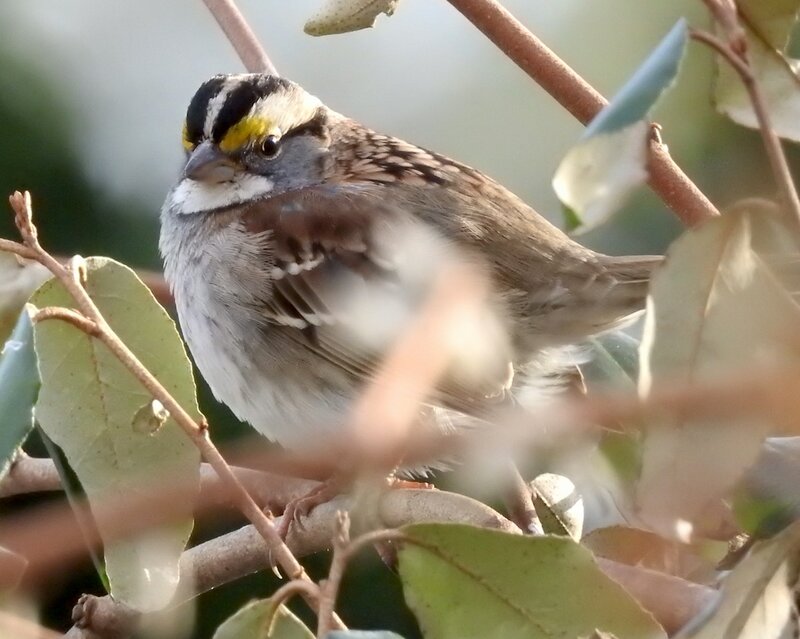 When I saw the yellow patch above the eye (ornithologists call this spot a “lore”), I knew I had something special—or at least something special to me: a white-throated sparrow. While many white-throated sparrows (Zonotrichia albicollis) spend the entire breeding season in northern Wisconsin and all of winter in Virginia, this species only comes through my area of southern Wisconsin during migration. So it’s a real treat to get to see one. Curious why it’s called a white-throated sparrow? This is a different white-throated sparrow than the one in the first photo—once I saw the first, I found several more. 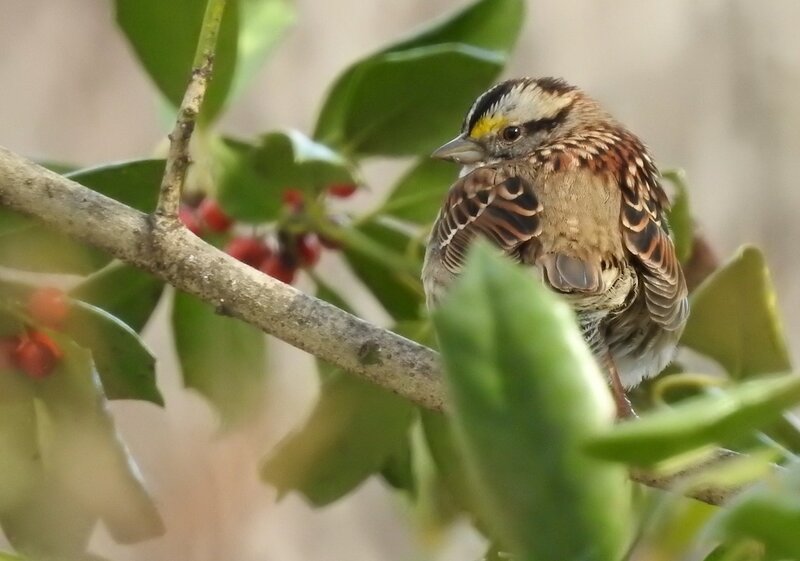 This, along with the yellow lore and distinctive black stripes, make it easy to distinguish the white-throated sparrow from house sparrows and other sparrow species on close inspection. However, if you don’t have a zoom lens or a pair of binoculars, you might not see the markings. At such times, hearing people can lean on the bird’s song to identify it. Here is an example of white-throated sparrow song. Hungry for more photos of sparrows? Check out my post about chipping sparrows.